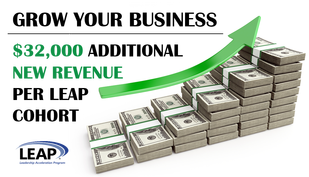 The LEAP® Certified Affiliate Program ﻿is ﻿a great way to grow your business. Learn how other consultants like you are growing their business while developing the next generation of leaders with the LEAP® Leadership Acceleration Program. Being in business for yourself has unique rewards and challenges. If you answer 'YES' to even one of the statements below, you can benefit from becoming a LEAP® Certified Affiliate. You love the work you do but hate the 'feast or famine' nature of the business. You would like to offer additional services to your clients but don't have time to create the offering & tools. You work with small-to-mid-sized organizations in your local market. You are looking for new clients in your area so you don't have to travel and can have more balance. You would like to make a more significant impact at the organizations or with the people you work with. You want a thriving business that produces income even during economic recessions. Curious about how adding LEAP® to your service offerings would impact your business? Schedule a 30 minute 1:1 conversation with Lynda Silsbee, Creator of LEAP® and Founder of the Alliance for Leadership Acceleration. ﻿﻿First, we’ll talk about LEADing – What LEAP is and how the LEAP program is leading the way to a better option for leadership development for the SMB market. LEAP is not a product, but a turn-key solution that you customize and deliver with your unique stories, experience, and style. We show you how you can lead in your market area as a licensee. Then, we’ll talk about GROWing – How LEAP positions you to grow your business… not just with LEAP cohorts but exponentially with referrals to other work. We showcase our Profitability Forecasting tool and review different pricing model scenarios. Finally, we hope you will be INSPIREd - to join our exclusive network of affiliates to bring the LEAP program to your market area.